Could Orion Ride Falcon Heavy to the Moon? 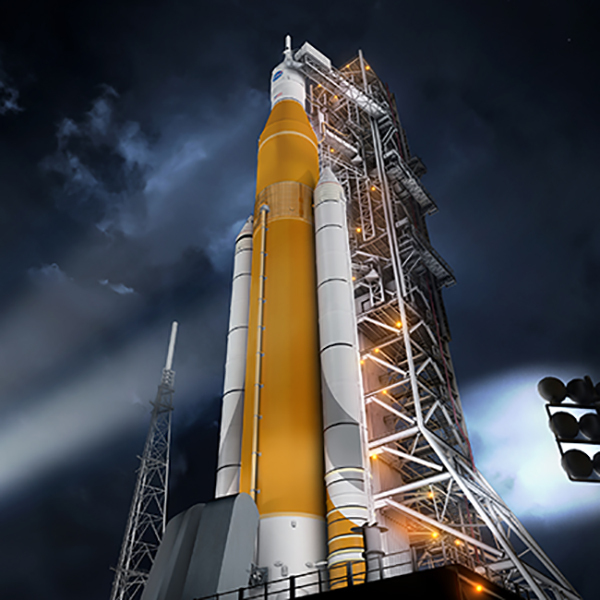 Things aren’t looking good for NASA’s Space Launch System (SLS). Occasionally referred to as the “Senate Launch System”, or even less graciously, the “Rocket to Nowhere”, the super heavy-lift booster has long been a bone of contention for those in the industry. Designed as an evolution of core Space Shuttle technology, the SLS promised to reuse existing infrastructure to deliver higher payload capacities and lower operating costs than its infamous winged predecessor. But in the face of increased competition from commercial launch providers and proposed budget cuts targeting future upgrades and expansions of the core booster, the significantly over budget and behind schedule program is in a very precarious position. Which is not to say the SLS doesn’t look impressive, at least on paper. In its initial configuration it would easily take the title as the world’s most powerful rocket, capable of lifting nearly 105 tons into low Earth orbit (LEO), compared to 70 tons for SpaceX’s Falcon Heavy. It would still fall short of the mighty Saturn V’s 155 tons to LEO, but the proposed “Block 2” upgrades would increase SLS payload capability to within striking distance of the iconic Apollo-era booster at 145 tons. Since the retirement of the Space Shuttle in 2011, NASA has been adamant that the might of SLS was the only way the agency could accomplish bigger and more ambitious missions to the Moon, Mars, and beyond. Or at least, they were. On March 13th, NASA Administrator Jim Bridenstine testified to Congress that in an effort to avoid further delays, the agency is exploring the possibility of sending their Orion spacecraft to the Moon with a commercial launcher. The statement came as a shock to many in the aerospace community, as it would seem to call into question the future of the entire SLS program. If commercial rockets can do the job of SLS, at least in some cases, why does the agency need it? NASA is currently preparing a report which investigates what physical and logistical modifications would need to be made to missions originally slated to fly on SLS; a document which is sure to be scrutinized by SLS supporters and critics alike. Until the report is released, we can speculate about what this hypothetical flight to the Moon might look like. Administrator Bridenstine didn’t specifically mention which commercial vehicle they were looking at during his Congressional testimony, but as the Falcon Heavy has the highest payload capacity of any currently operating launch platform, it would almost certainly be the focus of NASA’s report. It might seem like the considerably lower capacity of the Falcon Heavy would be a problem, but in reality, Orion’s proposed test flight to the Moon was never going to fully utilize the capability of the SLS to begin with. During “Exploration Mission 1”, the SLS is only responsible for getting the Orion, its Service Module, and the Interim Cryogenic Propulsion Stage (ICPS) into orbit around the Earth; it actually separates from the spacecraft at an altitude of just 157 kilometers. From that point on, Orion operates independently, and the ICPS is what actually propels the craft towards the Moon. The Orion and Service Module together weigh in at around 57,000 lbs, and the ICPS itself tips the scales at roughly 66,000 lbs. So at least in theory, any booster that can lift around 125,000 lbs into orbit should be able to stand in for the SLS on this first mission. That’s well within the capabilities of the Falcon Heavy, even if we assume a few thousand extra pounds for ancillary hardware and whatever adapters it would take to bolt everything together. A new fairing would need to be designed and manufactured to encapsulate such a large payload, but all things considered, it seems like it would be a fairly straightforward process. Interestingly, some quick back of the envelope math seems to indicate there’s another option on the table. Assuming NASA is willing to make some substantial deviations from the original mission parameters, it looks like the Falcon Heavy alone could potentially push the Orion most of the way towards the Moon itself without using the ICPS at all. This would not only make it easier to integrate the Orion hardware onto the Falcon Heavy, but would save the non-reusable ICPS for a future mission. According to SpaceX, the Falcon Heavy is capable of lifting a bit more than 58,000 lbs into a geosynchronous transfer orbit (GTO). As you may recall our last lesson in “Beginner’s Orbital Mechanics”, a GTO orbit is the first half of an orbital transfer from a low Earth orbit to the geosynchronous equatorial orbit (GEO) altitude of 35,786 kilometers. Once the spacecraft has been placed into GTO by the Falcon’s upper stage, onboard propulsion would raise its perigee to circularize the orbit and complete the transfer. This means the Falcon Heavy should just be able to put the Orion and its Service Module into GTO. Of course that doesn’t get you to the Moon, but it’s not quite that far off either. To reach GTO from Earth orbit, a spacecraft must increase its velocity by roughly 2.5 kilometers per second. By comparison, for lunar injection it needs to be accelerated by around 3.2 km/s. So how do we get the last 700 meters per second of acceleration? From the Orion itself. As per the design specifications, the Orion Service Module is able to provide 1.8 km/s of delta-v. In theory, it should be able to complete the trans-lunar injection maneuver with enough propellant in reserve to perform any necessary course corrections. In this theoretical scenario, there may not be enough propellant to actually slow down and enter a lunar orbit as originally intended. In which case, Orion could simply make a loop around the far side of the Moon and then return to Earth. This “free return” flight path was previously used as a contingency for the early Apollo missions; had the spacecraft been unable to perform the lunar orbit insertion maneuver, it would have allowed the crew to essentially “drift” home. These are interesting thought experiments, but unfortunately, the reality is likely to be quite a bit less exciting. Some believe that the statements made to Congress were essentially a threat directed at Boeing, the prime contractor on the Space Launch System. A not so subtle signal that the agency is getting tired of the delays and cost overruns. Indeed, just two days after his testimony, Administrator Bridenstine Tweeted that Boeing teams were working to accelerate the SLS timetable. Even if the Orion does fly on a commercial rocket, Administrator Bridenstine said the agency believes the mission would best be served by utilizing two launches and assembling the spacecraft in orbit. Until the final report is released, it’s unclear why NASA would select such a complicated path to the Moon. Especially considering that the Orion currently has no provision for orbital assembly, and this technology would have to be integrated into the vehicle on exceptionally short notice to meet the planned launch date of June 2020. If we’ll allow one last bit of conspiracy theory, some in the community have put forward the idea that NASA is proposing the most expensive and complex possible way to launch Orion on a commercial rocket to help bolster the idea that the SLS is indispensable. If the world sees Orion’s Exploration Mission 1 completed on the back of just a single Falcon Heavy, at 1/10th the cost of flying on the SLS, it would arguably be more humiliating for the agency than simply scrapping the mission entirely. Calling a cab instead of building a car. What’s wrong with that? Whats wrong? Not having a car afterwards/for the next time. Lol wut. Soooo, the SLS is thrown away after every launch so actually, calling a cab here is the smarter move. For you see, the falcon heavy is *reusable*. So this cab can be re-fueled and used again. Can your SLS? Could they launch Orion using Orion? Hell, they could use Orion to launch Orion! Maybe they could even get Orion involved. Give him something to do. The Orion concept could handle massive loads, but there was a slight issue with the amount of radioactive fallout (IIRC, it was calculated that a single launch would result in 4 people dying from the effects of radiation) and also international treaties that forbade nuclear weapons in orbit (which kind of ruled out a ship load of A bombs). Of course you should not call it “nuclear weapons” but “nuclear propulsion devices” or “nuklear fuel elements”. Orion was never intended to be used in the atmosphere. NERVA (pewee and pewee 2 being the last tests of the system) would be the nuclear rocket design to use. We should be actively working towards a NERVA style rocket system. Saturn V was very near the max we will ever be able to get out of a chemical rocket. For flinging really big payloads really far we need nuclear. I saw one idea that has merit. Just ring an Orion with SRBs and lift it above the bulk of the atmosphere. That would reduce the fallout by a lot. I saw that same idea/proposal as well. I still think Orion could be an excellent design, but even a nuke-bug like myself has concerns with launching it directly from the surface! I believe Nerva is still the most realistically achievable option. Well, Boeing is a little distracted just now. Maybe they can just put an MCAS in the thing after changing engines and not tell anyone. Worked last time…oh wait. I’m a fan of SpaceX, but Elon’s amazement that the Heavy worked was pretty evident. If he didn’t think there was a reason to have total confidence in it…hmmm. Maybe it needs a few more practice runs itself? Anything that makes more rockets launch makes me happy. Sorry Elon, it’s never going to become boring to me. Well to be fair, Falcon Heavy will have had 1 or 2 more flights between now and 2020 when this mission is supposed to happen. SLS will have 0. Which is perhaps one of the elements of this situation which isn’t being addressed. Exploration Mission 1 is as much a test of SLS as it is Orion. You can fly Orion on a commercial rocket to get the mission going on schedule, but then SLS still needs a test flight of it’s own before humans go on it. Granted the Shuttle didn’t get a test before they put astronauts onboard, but I don’t think modern day NASA would do that again. Who told you NASA would change their ways as a result of past events? Killing 7 astronauts didn’t work first time, why would it work the second time? The Columbia incident is deep down precisely the same as the Challenger: It wasn’t a problem last time, why would it be this time? During the two weeks that Columbia was in orbit, there was a discussion: “Should we take a look at that wing that was struck by the block of foam?”. Because that would delay the mission by a day (either in missed experiments or a later return with less margin for say weather related delays) they decided not to. That’s the same: it explode last time, so it should be fine reasoning that happened with the O-rings that didn’t seal as intended on challenger. Typo correction: “it explode last time” should be “it didn’t explode last time”. It’s not commonly known, but back in the 1960’s an oxygen tank on a manned spacecraft 1/2 way to the moon exploded. A NASA employee who’s name has been lost to history reportedly stated that failure wasn’t an option, rallied everyone around him, and together, they defied the odds and brought the crew home, tired, and sick, but alive. Fast forward a few decades, and the prevailing response is a collective shrug of the shoulders and an “ehhh, couldn’t do anything about it anyway, so why bother even trying”. Yea, we lost something along the way, and I’m not referring to Columbia or Challenger. It is important to note that the Falcon Heavy is not man-rated, and SpaceX has no plans to rate it. To the best of my knowledge, no one with decision making authority has publicly suggested launching a manned Orion mission aboard the Falcon Heavy. Only a launch of the unmanned EM1 mission aboard an unnamed (but presumably Falcon Heavy) rocket is even a possibility on the table from what I’ve read. Any discussion of manned Orion launches on anything other than the SLS is pure media speculation. Not that I don’t see any reason why it couldn’t be a viable option. I’m sure SpaceX would be more than happy to do the necessary work to man-rate the Falcon Heavy if NASA/Congress decided to write them a large enough check to make it worth their while. I think the plan for the “dual launch” of the EM1 was Delta-IV Heavy for Orion, and the ICPS on Falcon Heavy. Not bothering with the ICPS (as the article suggested) is pointless because the point is to test Orion *and* the ICPS. Future missions need the ICPS, so just testing Orion isn’t a help. And Orion goes on DIVH rather than FH because, of course, it already has, so you don’t need any work to do it. Of course as Bridenstine has already demonstrated, the whole thing was really just a PR shot across the bow to Boeing to tell them to get their act together, so it’s all pointless anyway. It’s all “pointless” by that logic. Orion has already flown in space, and ICPS is just a modification of a Delta upper stage. There’s very little in the way of a clear goal for EM1 to begin with, and leaving ICPS behind isn’t going to change that. 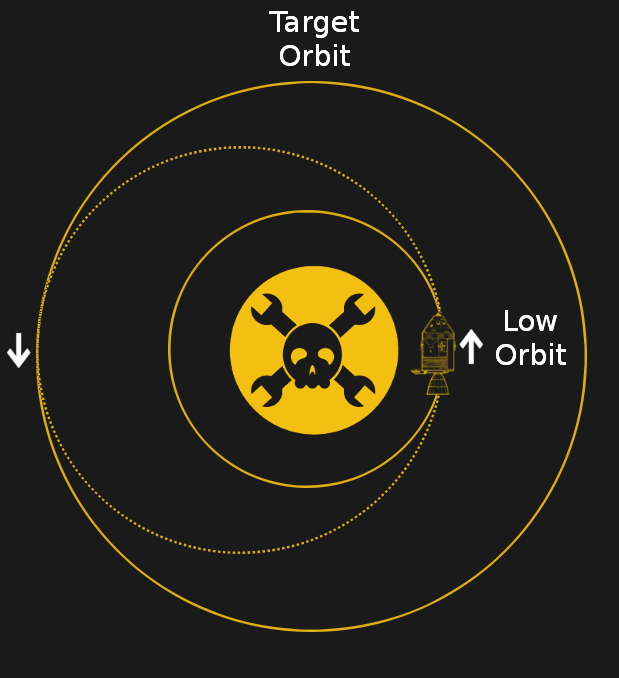 Orion’s flown 2 orbits. It’s not some major flight proven thing. EM1 was a multi-day cruise in coislunar space, in a much different radiation environment. Similarly, ICPS is standard tech, but it’s not been flown with Orion. It’s a good test. Only an incomplete Orion capsule with a heat shield design that was depreciated before it even launched has flown in space. The Orion ECLSS and service module have never flown in space. Yeah, but FH should be able to lift the ICPS too so it’s kind of a moot point. You could leave ICPS behind to streamline the process and save it for another mission, but it’s not mandatory. Doing dual launches just because Orion already flew on Delta before is crazy. It will be harder to make Orion and kick stage dock together than it would be to make a payload adapter to put Orion stack on FH. In the Apollo program, the Saturn 1B was often used to test hardware, before the Saturn V was ready or needed. Even in the Skylab missions, Skylab was placed in orbit by the last flight of the Saturn V, all manned missions used the Saturn 1B to get the crew there. So perhaps the FH could serve a purpose in the overall program. Right, which is why the implied suggestion was ICPS on a FH and Orion on a DIVH. Launching Orion on a FH too (or doing the reverse) would be possible, but it’s hard to imagine that you would choose that route given that Orion’s already launched on a DIVH, and since the launch would be near-simultaneous the logistics might work out better with two different launch companies anyway. Future missions won’t use ICPS. That’s where the whole “Interim” part of the name comes from. If all goes according to plan, Exploration Mission 2 would use the ICPS for just a couple early Earth orbit maneuvers and then dump it so the rest of the mission could be done with Orion’s own thrusters. For Exploration Mission 3 (and beyond), the Orion would be using the so-called Exploration Upper Stage instead of ICPS. So saving the ICPS and using it on EM2 (where there’s less of a demand on it to begin with) makes perfect sense. Why build a whole new ICPS for EM2 when FH’s upper stage could fill in for it on EM1? Yes, of course ICPS will be barely used because EUS is coming and we all know SLS never has schedule slips, right? Everything’s always on time. EM1 is a multi day checkout in cislunar space. You can’t do that without the ICPS, you don’t have the delta-V.
As for EM2, if you don’t have ICPS there, you have less margin for aborts on a first crewed flight. Good luck with that. Yes, ICPS is barely used there, but that’s just because of the humans aboard: you just want a quick flyby checkout at first. I should be been more clear at first anyway: its not the ICPS that’s a big deal (obviously it’s just a Delta upper stage) it’s the combination of the two, and a lot of those factors are common between any upper stage. Software, avionics, some mechanical, etc. While true, Exploration Mission 1 was always planned to be unmanned so that doesn’t really change anything. Presumably by the time they are ready to put crew on Orion, SLS will be completed. Maybe. Of course it would be cheaper and faster to man-rate FH than complete SLS, but one step at a time. The FH isn’t man rated, and when NASA was not planning to use anything but the SLS to launch the Orion and the F9 was plenty to launch the Dragon, why go to the expense of making the FH man rated? The problem is, of course, that private industry can almost always do something faster and cheaper than a government. NASA has done incredible things for space exploration, but I think it’s time to consider a reduced role. As much as NASA’s culture tends to slow things down, the problems with SLS are almost entirely caused by the fact that it was engineered by and for politicians. Its primary objective was to maintain the flow of money to legacy Shuttle contractors, and secondarily to vector a slice of pork to every state in the union. Any spaceflight consequences are a minor side effect. As it turns out, it has been very effective at its primary and secondary objectives, with no material side effects. It’s possible, in principle, to have NASA at the forefront of human spaceflight again. We just need to let it off of Richard Shelby’s leash and allow the aerospace nerds and engineers to make aerospace engineering decisions. SLS engineering, testing and manufacturing is being done by private industry. NASA has never built a human rated spacecraft, it has always relied on contracting private industry for that task. If there is a problem, it lies in that the cost plus structure of the SLS contract means that when the schedule slips and there are mistakes or failures, NASA pays more money to Boeing to resolve them. In this contract model it is literally in private industry’s best financial interest to find the line just above failing so bad the project is cancelled or rebid and underperforming enough to draw the program out. In contrast, programs like Commercial Crew are using fixed price contracting with payments on milestone achievements, letting the contractors share the risk. When they slip schedules, they end up cutting into their profit margins due to higher labor and operational costs. That doesn’t account for all of it though. Boeing recently had to push back the first test flight of their CST-100 capsule, too and it is on a fixed price contract. The main problem with NASA, is, that like MOST government agencies, they have lost sight on their “mission”. When NASA came along in the late 50’s, it was populated by scientist types that wanted to explore. 50+ years later, it is another bloated government agency that is more concerned about image, and decor than actually DOING SOMETHING. It started to lose its way, about the end of the Apollo program. Look at how long it took to get the shuttle flying, and, when it did fly, the ORIGINAL idea of launching it on the back of an “airplane” type idea was scrapped to the external tank/solid boosters. Then when they went all enviro-friendly to the foam insulation, it caused the problems that ultimately doomed Columbia. Literally what are you talking about. Very early Shuttle concepts used a large piloted winged booster to get the Orbiter most of the way into space. Not entirely unlike what Virgin is doing with their vehicle, but on a much larger scale. Eventually this was replaced with the solid rocket boosters and external tank of the final design due to concerns with cost/complexity. As for the foam, in the late 1990’s, the EPA pressed NASA to use a more environmentally friendly foam for the external tank as the original formula used freon. The new foam didn’t stick to the tank as well as the original formula, and pieces falling off damaged the Shuttle’s heat shield. In the case of Columbia, the damage was bad enough that the Shuttle was destroyed. The foam had problems staying on right from the start, Columia just got “lucky” that it hit a leading edge instead of anything cricical. There was a bazzlion adherance tests done with the foam, but somehow it never occured to anybody that a metal tank shrinks when it comes into contact with supercooled LOX and LH. They kept being baffled why the foam keeps comming off, when it was perfect when it left the factory or even the VAB. Only when there was an aborted launch, which involved filling and later draining the tank, did someone have the idea to X-ray it. Guess what they found in the foam? Cracks. Big ones. They weren’t there before the tank was filled. Only then did they put 2 and 2 together and sought a more compliant foam, that would not crack so badly. The main problem was, that despite having a concernable incident with the heatshield getting damaged (you can only guess by what…) on a less critical section right on it’s first test flight to orbit, nobody important at NASA saw the need to at the very least implement a procedure to check the heatshield before attempting reentry on later mission. This came only after the NASA acronym got a new meaning – Need Another Seven Astronauts. Not before then. Well off course having a heat shield damaged by foam didn’t make them add any new safety procedures. It worked once with a damaged heat shield, that means damaged heat shields have flight heritage and aren’t a risk. Why is it that 50 years ago we needed a big giant rocket so we gave a bunch of money to places that make these sorts of things and a few years later we had a big giant rocket, yet today we spend enormous amounts of money with not a whole lot to show for it…. Because they learned they can string you along for a bit, because governments aren’t allowed to bankrupt companies. 50 years ago, getting to the moon was a national priority (Cold War, etc.) and the Apollo program was treated as such. The old saying was ‘waste anything but time’, and they did exactly that. As a result, they got rockets that were good for one launch, hideously expensive to build and use, and were extraordinarily dangerous. The whole thing wasn’t sustainable, but that was OK, as it was never designed to be in the first place. Fast forward 50 years. Going back to the moon isn’t a national priority (whether we like that or not, it is true), and NASA is a bloated mess run by ‘crats more interested in keeping their own nests feathered than actually accomplishing anything while they pay captive contractors vast fortunes to build systems JUST barely good enough to require endless modifications while not being bad enough to being cancelled entirely. SLS is a perfect example of this, as it exists for no reason other than to keep jobs in Richard Shelby’s state. As a result, everyone is far more concerned about making sure the paperwork is properly filled out and that the pork is distributed….going to the moon is a low priority if indeed it is a concern at all. You basically just described how almost every federal agency is run. Which is extremely depressing. Short answer: Not really. Yes, Orion could be adapted to Falcon Heavy, and it would likely work, but the end goal of SLS is not the moon, its Mars, and that requires the lift capability of SLS Version 2. BFR is the only real possible replacement for SLS, but even then, we need multiple variants of heavy lift, not just one, and we need one that is government owned at least. SpaceX is a private company, they live at the whims of business, not the needs of society. I want both SLS and BFR, and chances are, if SLS get’s cancelled, NASA is next on the chopping block, because while the GOP claims to love Space (because it feeds defense contractors that live in their constituency), they don’t like science, and they would cut it at a moments notice. Two Falcon Heavy launches could get an Orion to Mars (I believe). The first launch would be the capsule itself to LEO. The second would be an attachable high ISP vacuum optimized booster. The two meet up in orbit, then execute their burn from LEO to TMI. This would definitely work to get Orion to the moon. Without aerobraking, the delta-v to Mars is 2.5x that to the moon, so it might take 3 Falcon Heavy launches. That said, I don’t think SpaceX should go this route. Just make Starship and get there on SpaceX architecture first. The Russians don’t make a lifter in this class. The largest they have in production- the Proton-M – can only lift 23 tones to LEO. The Soyuz series they use to get to the ISS is only rated as a Medium lifter, with a capacity of about 8 tones to LEO. The Falcon Heavy is the heaviest rocket in current production at 62 tones to LEO. The BFR and SLS block 1 are planned to lift around 100 tones. As to why, the answers are Science and Technology. Both have real world spin-offs that make life down here better. It’s not a case of either/or, and it’s short sighted to think otherwise. Although former NASA administrator Bolden used to like to refer to Orion as the spacecraft that would take us on our journey to Mars, under proposed mission concepts that is like saying the Uber that takes me to the Airport in Orlando is the vehicle that I will use on my journey to San Francisco. Orion was designed with maximum mission duration of 21 days with an additional 6 months in quiescence (docked to a vehicle or station that is providing power and life support). It is purpose built for lunar or Lagrange point missions. Current NASA Mars plans involve astronauts traveling to the Lunar Orbital Platform – Gateway (LOP-G) in an Orion, and at the Gateway, boarding a Deep Space Transport (DST) to Mars orbit. It doesn’t matter what you launch it on, Orion unfortunately lacks the ability to operate in space for the amount of time needed to get to Mars and back with currently practical propulsion methods. It would of course be possible to redesign Orion for longer missions, but that’s not as easy as just putting a bigger oxygen tank somewhere. It’s literally designing another version. Design of Orion began under the name Crew Exploration Vehicle in 2006, and has garnered a cost of roughly 16 billion dollars to date, with projections of it not being ready to fly in a nearly complete unmanned version until 2021 (the plan discussed in this article projects the idea of speeding up that timeline, presumably to put the flight as a positive accomplishment prior to the next presidential election). A Mars capable variant would not come quickly or cheap. And NASA lives “at the whims” of the president and the senate, not necessarily the needs of society. So if the good old Saturn V has so much more thrust, then why not use that design? Or modified safer version? It was massively expensive, about $1bn per launch in today’s money, and as mentioned above, the blueprints only get you so far. Many of the parts are no longer available, we don’t have people with the required fabrication skills and much of the fine detail is missing. It’s cheaper to start with a clean sheet and design something using today’s technology, which is exactly what is being done with BFR and New Glenn. A second run of Saturn Vs would have been cheaper than the first but they would still cost a half billion each. Though they did propose bringing back the F-1 engines as the F-1B for SLS block 2 and it increased performance enough they didn’t need the EUS to meet the 150ton LEO payload goal or for a lot of the early lunar missions. given that all the tooling would have to be recreated from scratch, it’s questionable if a second run now would be any cheaper. But the F1B example is exactly why trying to recreate the Saturn V is such a bad idea. They spent a lot of time trying to recreate the engine, and ended up with a newly designed engine that is similar to the original, not a update to the original design. The tools, materials, and knowledge are so much better now than they were a half century ago that you are far better designing from scratch than trying to re-use designs. If we still had all the tooling setup and operational, that would be a reason to try and be similar to the original,but all of that is gone at this point (deteriorated and/or recycled), it’s just not worth trying. How about strap-on boosters for t he Falcon Heavy? I haven’t seen that suggested yet. I’m not sure how Energia did it, but I’m confident it was designed from the ground up to hold all those external boosters. The FH already has a core designed to support add-on boosters, it’s less work to make it able to support more than to add them on to a booster that wasn’t designed for it. In any case,SpaceX has already gone through the excercise of redesigning the F9 first stage to support side boosters, and they did it recently, so I’d bet that they could modify it fairly easily. But the limiting factor of the F-H is the second stage, it’s far less efficient than the Delta V second stage, so if it was really needed, I’d bet the focus would be there. But SpaceX is moving quickly on their new rocket, which will be far more powerful (as well as more reusable), and that is probably going to fly before any version of the SLS would. Right, as far as I know the designs for Falcon and Falcon Heavy are now frozen and all new development has moved to BFR. There was originally some talk of using a scaled down Raptor engine for an enhanced Falcon second stage to address the efficiency issue, but pretty sure that’s also been canceled in favor of just moving ahead with the next generation booster. They are Frozen in that SpaceX wants to spend it’s resources on the BGR,but they are still going to make smaller changes as they find issues. there was one issue found in their Dragon II test launch where they worked around it for that launch by modifying the flight profile, but the real fix is a slight hardware design. Avoiding the bug that caused the paddles to freeze is another small hardware change that they are making to the rest of the fleet. Might be easier to add SRBs to the Delta Iv Heavy and make use of propellant densification which should get another 18.5 tons of payload according to ULA documents. This is still short of FH’s LEO payload but the TLI payload would be higher. Or try and reinforce the center core of Falcon heavy to handle the weight of the DCSS and Orion. All of these can be cheaper than SLS but none of these mods are going to fly before 2020. “Senate Launch System” – Why? is it possible to launch some unwanted politicians into a STABLE orbit? Stable, so it will not decay prematurely without thrusters. What about a TLS, to shoot the current US president into an orbit? SLS is just dumb and does not help NASA at all! They need to be trying to build cheaper launch systems not remaking old ideas. They should be focusing on doing the same as spaceX and increase reusability, because that is the only true way to lower the costs. It doesnt help that every 4-8 years some doofus changes the whole plan. Giant waste of money! Should have funded my idea instead. 2 1/2 tons to lunar orbit, cost would be less than £25M including the fuel. Only major problem is it would be nuclear but a comparatively small plant based on an IEC with a few superconducting components. LN2 cooled mostly but uses water as propellant. Falcon Heavy could send Orion on a free return if it’s service module does part of the TLI burn but there will not be enough propellant left to enter lunar orbit. If you want to enter lunar orbit you might be better off just spitting the mission between two rockets. It might be possible to have Delta Heavy put Orion into high LEO and then Falcon Heavy put a mostly full upper stage in Orion docks with it and does an eyeballs out burn like the original plan with Ares.